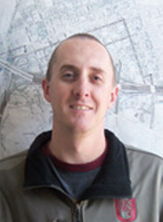 Cameron Greer – Utility Mapping Services, Inc.
Cameron Greer is a graduate of MSU with a B.S. in Construction Engineering Technology. Mr. Greer is fluent in MicroStation V8i, GEOPAK, and Trimble Geomatics Office. He performs a large portion of the data processing and CADD development for SUE plans and submittals. He has spent time in the field surveying utilities and performing utility designating/locating operations, and therefore has a comprehensive knowledge of the entire flow of data from research and acquisition to final submittal, including coordination with designers. Mr. Greer also performs utility coordination services, and is adept in conflict identification, resolution negotiation, and agreement preparation.